On February 20, 2014, Freedom Party’s Al Gretzky was a guest of the Andrew Lawton Show (AM980, London, Ontario) to discuss a news story about the CEO of the Community Care Action Centre – a government-funded organization – Sandra Coleman, who has realized a 144% salary increase since her hiring in 2006. On London Today (NewsTalk 1290AM CJBK, London, Ontario, with host Andy Oudman) Paul McKeever, leader, Freedom Party of Ontario, discussed the release of the party’s 2014 Opposition Budget: the only balanced budget proposal issued by any Ontario political party. 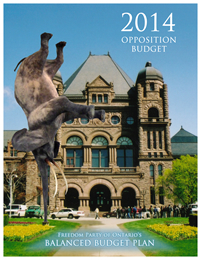 “When it comes to balancing Ontario’s mammoth budget deficit, Ontario’s government health insurance monopoly is the elephant in the room. 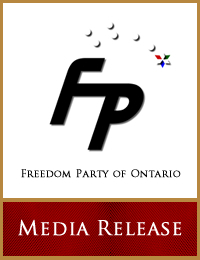 That is the central message of a 2014 “Opposition Budget” released today by the Freedom Party of Ontario. It is the only balanced budget plan released by any registered political party in the province…” Click here to read the full media release. 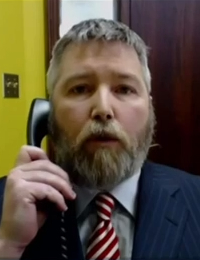 AM980’s Andrew Lawton asks his callers who they will vote for and…surprise! On May 2, 2014, NDP leader Andrea Horwath said that her party would vote against the Liberal budget released one day earlier, and that resulted in Liberal Premier Kathleen Wynne’s march to the Lieutenant Governor General of Ontario, who was asked to dissolve the Legislature. An election writ would be dropped the following Wednesday, May 7, 2014. Andrew Lawton (host of AM980’s Andrew Lawton Show in London, Ontario) opened his phone lines and asked his audience who they were going to vote for, especially given the PC/Liberal/NDP’s silence on the issue of balancing Ontario’s budget. The result was surprising.